As we enter the third enrollment period for ACA, patients and providers are finding some of the kinks getting worked out — but many issues still need attention. For medical practices and insurance providers, one of the main challenges is, quite simply, staying profitable. As patients struggle with increased premiums and deductibles, they also hope the promised cost savings of ACA will come to fruition though, so far, results are mixed. The influx of newly insured individuals has indeed contributed to rising revenues for insurance companies. The latest numbers from McKinsey indicate that, from 2013 to 2104, absolute enrollment grew by 17 million people and absolute revenue grew by $86 billion. Profit numbers tell a more nuanced story: only 35 percent of payors saw a profit in the first year of ACA. After reinsurance and risk adjustment, payors lost $2.5 billion in the individual market in 2014, an average of $163 per member. Controlling costs and maximizing profits is a top priority throughout healthcare. In medical practices, one obvious source of lost revenue and unnecessary costs is rejected claims. Healthcare claim processing errors can result in a host of troubles for both patients and practitioners, and rejected claims tend to cause the most trouble overall. Around 10 percent of all medical claims are initially rejected. Surprisingly, 55 percent of rejected claims are never filed again. CMS reports only a small fraction of rejected claims are due to coding errors; claims are much more commonly rejected due to incomplete or invalid information. In fact, basic errors in recording patient demographic data (age, date of birth, name, and home address) and insurance details are the primary reasons that medical claims get rejected. The average medical claim value for a primary care office is $125; if rejected claims are not resubmitted or eventually denied, that revenue is lost. Rejected claims get returned back to the healthcare practice to be fixed, costing the practice an average of $25 per reworked claim. This includes internal resources as well as processing fees. AHIP’s Center for Policy and Research published a study showing that fees for clean, auto-processed claims are under a dollar, but much higher ($3.99 average) for pending and returned claims. If a practice routinely fails to submit accurate and complete claims, these costs can put a significant dent in profits. Resubmitting claims takes up valuable time and resources, and can delay the revenue cycle for months, thereby creating cash flow and accounting issues as well. When the claim error involves patient data, office staff will often need to track down the patient and wait to for them to respond with the corrected information. This represents an inconvenience for both staff and patient. In the end, up to 65 percent of rejected claims are never sorted out. It is much easier and more efficient to ensure correct data capture while the patient is still present in the office for their appointment. Medical practices have addressed the issue of flawed and delayed processing by submitting claims electronically. As recently as 2002, less than half of claims were submitted electronically, but now at least 94 percent are handled this way. This significantly reduces the time between a patient’s appointment and the insurance company’s receipt of the claim for that service. Electronic processing is also less prone to error, but depends on accurate data being fed into the system to begin with. Many practices are deploying additional technologies to ensure better data capture. Automated registration processes that use self-service kiosks or card scanners can be integrated with EMR systems and policy databases to make sure patient data is accurate and verified. These systems can significantly reduce errors in patient files and claims submissions, as well as enhancing overall productivity and customer service. As the ACA system develops and matures, medical practices will have to adapt to lots of changes. Regulations will continue to shift, coding systems will remain complex, and insurance companies probably won’t get easier to work with. Healthcare providers can protect their profits by streamlining patient intake and registration, automating data capture and integrating records with verification systems. For the promise of affordable healthcare for every American to be realized, every stakeholder in the system has to prioritize cost control and improved efficiency. Rejected claims represent a significant area of resource waste that can be addressed immediately with available technology. 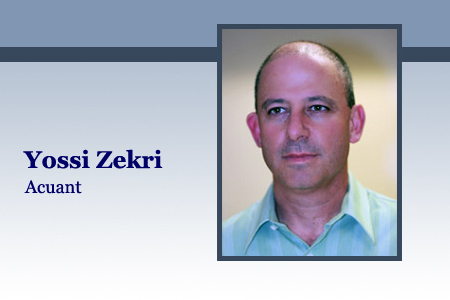 Yossi Zekri is president and CEO of Acuant, the leading provider of identity solutions. Acuant’s award-winning and patented credential management solutions automate the intake, processing and verification of unstructured data from ID documents. Leveraging virtually any device, the company’s solutions transform this data into useful and insightful information used in critical business applications, whether local or in the cloud.